Synthetic peptide within Human HDAC2 aa 450-550 (C terminal). The exact sequence is proprietary. WB: HAP1, A431, Hela and K562 cell lysate and rat brain tissue homogenate. IHC-P: Human breast carcinoma and rat spinal cord tissue. ICC/IF: MCF-7 and wildtype HAP1 cells. Flow Cyt: HeLa cells. Our Abpromise guarantee covers the use of ab32117 in the following tested applications. WB 1/2000. Predicted molecular weight: 55 kDa. Flow Cyt 1/60 - 1/100. IHC-Fr 1/500. May require antigen retrieval if fixing frozen section in paraformaldehyde. Responsible for the deacetylation of lysine residues on the N-terminal part of the core histones (H2A, H2B, H3 and H4). Histone deacetylation gives a tag for epigenetic repression and plays an important role in transcriptional regulation, cell cycle progression and developmental events. Histone deacetylases act via the formation of large multiprotein complexes. Forms transcriptional repressor complexes by associating with MAD, SIN3, YY1 and N-COR. Interacts in the late S-phase of DNA-replication with DNMT1 in the other transcriptional repressor complex composed of DNMT1, DMAP1, PCNA, CAF1. Deacetylates TSHZ3 and regulates its transcriptional repressor activity. Widely expressed; lower levels in brain and lung. S-nitrosylated by GAPDH. In neurons, S-Nitrosylation at Cys-262 and Cys-274 does not affect the enzyme activity but abolishes chromatin-binding, leading to increases acetylation of histones and activate genes that are associated with neuronal development. In embryonic cortical neurons, S-Nitrosylation regulates dendritic growth and branching. Lanes 1 - 4: Merged signal (red and green). Green - ab32117 observed at 60 kDa. Red - loading control, ab8245, observed at 37 kDa. ab32117 was shown to specifically react with HDAC2 when HDAC2 knockout samples were used. Wild-type and HDAC2 knockout samples were subjected to SDS-PAGE. ab32117 and ab8245 (Mouse anti GAPDH loading control) were incubated overnight at 4°C at 1/2000 and 1/10000 respectively. Blots were developed with 800CW Goat anti Rabbit and 680CW Goat anti Mouse secondary antibodies at 1/10000 dilution for 1 hour at room temperature before imaging. ab32117 staining HDAC2 in wild-type HAP1 cells (top panel) and HDAC2 knockout HAP1 cells (bottom panel). The cells were fixed with 100% methanol (5min), permeabilized with 0.1% Triton X-100 for 5 minutes and then blocked with 1% BSA/10% normal goat serum/0.3M glycine in 0.1% PBS-Tween for 1h. The cells were then incubated with ab32117 at 1/250 dilution and ab195889 at 1/250 dilution (shown in pseudocolour red) overnight at +4°C, followed by a further incubation at room temperature for 1h with a goat secondary antibody to Rabbit IgG (Alexa Fluor® 488) (ab150081) at 2 μg/ml (shown in green). Nuclear DNA was labelled in blue with DAPI. ab32117 staining HDAC2 in MCF-7 (human breast carcinoma) cells by ICC/IF (Immunocytochemistry/immunofluorescence). Cells were fixed with 4% Paraformaldehyde and permeabilized with 0.1% tritonX-100. Samples were incubated with primary antibody at a dilution of 1/500. A goat anti rabbit IgG (Alexa Fluor® 488) (ab150077) was used as the secondary antibody at a dilution of 1/1000. DAPI was used as a nuclear counterstain. Negative control 1: PBS only. HDAC2 was immunoprecipitated from 1mg of Hela(Human epithelial cell line from cervix adenocarcinoma)whole cell lysate with ab32117at 1/50 dilution. Western blot was performed from the immunoprecipitate using ab32117 at 1/1000 dilution. Anti-Rabbit IgG (HRP),specific to the non-reduced form of IgG, was used as secondary antibody at 1/1000 dilution. Immunohistochemical analysis of HDAC2 expression in paraffin embedded human breast carcinoma tissue section, using 1/250 ab32117. Overlay histogram showing HeLa cells stained with ab32117 (red line). The cells were fixed with methanol (5 min) and then permeabilized with 0.1% PBS-Tween for 20 min. The cells were then incubated in 1x PBS / 10% normal goat serum / 0.3M glycine to block non-specific protein-protein interactions followed by the antibody (ab32117, 1/100 dilution) for 30 min at 22°C. The secondary antibody used was DyLight® 488 goat anti-rabbit IgG (H+L) (ab96899) at 1/500 dilution for 30 min at 22°C. Isotype control antibody (black line) was rabbit monoclonal IgG (1µg/1x106 cells) used under the same conditions. Acquisition of >5,000 events was performed. This antibody gave a decreased signal in HeLa cells fixed with 4% paraformaldehyde (10 min)/permeabilized in 0.1% PBS-Tween used under the same conditions. ab32117 staining HDAC2 in Rat spinal cord tissue sections by Immunohistochemistry (IHC-Fr - frozen sections). Tissue was fixed with paraformaldehyde and blocked with 1% BSA for 30 minutes at 25°C. Samples were incubated with primary antibody (1/500 in PBS + 0.2% TritonX + 1% BSA) for 16 hours at 4°C. An Alexa Fluor®488-conjugated Donkey anti-rabbit IgG polyclonal (1/1000) was used as the secondary antibody. Antigen unmasking with sodium citrate buffer (10mM sodium citrate, 0.05% Tween 20, ph6) was necessary to obtain a good signal. The sections were counterstained with DAPI. Publishing research using ab32117? Please let us know so that we can cite the reference in this datasheet. Regarding the HDAC2 antibody detailed below. I would prefer a replacement antibody. I will be able to send photos of the antibody working and not working as soon as our camera to the microscope has been fixed. I am sorry this product did not perform as stated on the datasheet and for the inconvenience this has caused. As requested, I have issued a free of charge replacement with the order number 1211207. Current vial of ab32117 is not working. Pevious lot has worked. Human brain samples. Thank you for your telephone call this afternoon. I am sorry to hear that the current lot of ab32117 is not working so well for you. I appreciate the time you have spent on these experiments, and it is regrettable the results have not been successful. As the first vial purchased worked well in the same experiments, it seems on this occasion you have regrettably received a bad vial. I would like to offer a free of charge replacement or credit note in compensation (providing the product has been purchased in the last 6 months). In order to arrange this, I would appreciate if you could confirm your order number and date of purchase? I would also appreciate if you are able to provide any images from the vial that had worked, and the one that has not. This will be very helpful for our quality monitoring and investigations. Canwhole blood be usedin Western blot? At this point I haven't found a protocol for using whole blood in Western blot. Some of the resources I've found (linked below) indicate that the high content of hemoglobin and other proteins in whole blood, red blood cells, and leukocytes/plateletsinterfere with antibody binding. Is there a particular cell type that you are hoping to analyze? 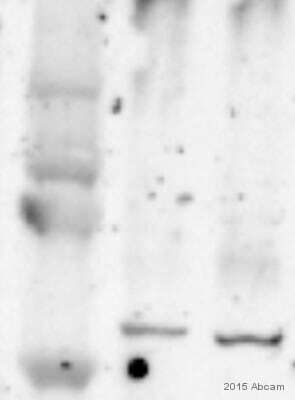 I might be able to find a reference for analyzing these cells in Western blot. I hope this information will be useful, but please let me know if you have further questions or if there is anything else that we can do for you. normal lysates with Ripa buffer produce the same bands! I will try to find another positive control. Thanks you for your email. I will look forward receiving the results soon. Let me know if this antibody show multiple bands with normal positive control lysates. - Have you added protease inhibitors when preparing the nuclear lysates? Do you know if the kits has protease inhibitors in it? I do not add any protease inhibitorsas the kit includes a prorease inhibitor cocktail. - At what temperature the extract were heated with sample buffer (LDS) and for how long? The samples are denatured with DTT for 5min at 95C. I have thoroughly checked the protocol again, which looks fine to me. The nuclear extraction kit also have protease inhibitors initso these should also not be a problem. As per your feedback the antibody works well in Immunohistochemistry so I am little unsure about the cause of multiple bands at the moment. We unfortunately also not have rat specific images so I am sorry I am unable to do anycomparison ofresults. I would suggest usingstandard lysates of rat dorsal horn tissues (with RIPA buffer lysis) andK562 cell lysates as positive control. This way you can compare the data we have on the datasheet and alsoin the related publications. I am sure the antibody will be fine. if in case the multiple bands don't go away even after trying the positive control, please let me know I will be happy to assist further.